California may be a liberal stronghold known for progressive policies like medical marijuana (and now legalized recreational use of it) and high speed trains, but that is not all. Many of these initiatives bypassed the legislature and came to be law through the ballot measure process. But this process has been used for other purposes too. Remember how gay marriage was stopped with Prop 8? The same thing can happen with other causes too. So, is the death penalty still legal in California? The answer is yes. California voted on whether to ditch the death penalty or reform it on Nov. 8 in two proposition votes, Prop 62 and Prop 66. But to truly understand, you have to start at the very beginning. 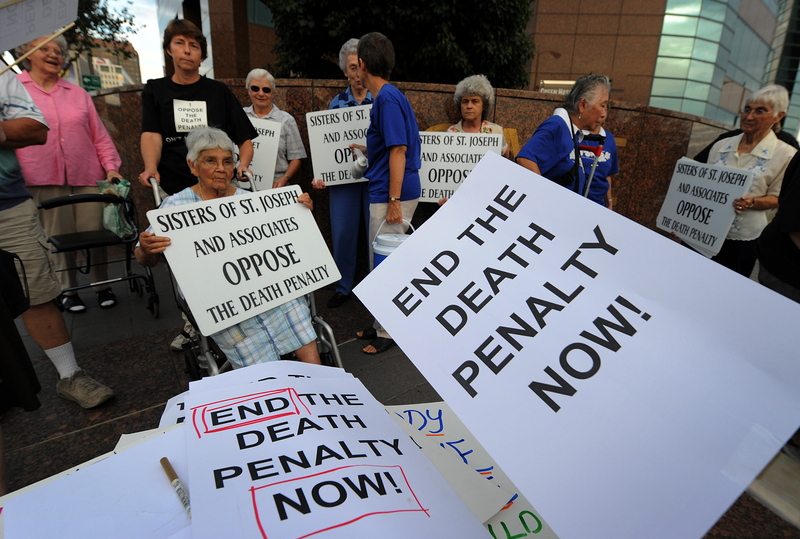 Capital punishment in California has been on the books nearly since it became a state in 1850. It was authorized under the Criminal Practices Act a year later. There have been some updates over the years. In 1891 it was decided only the state could execute at state prisons — no counties could carry them out. Then the method shifted from hanging to a gas chamber in 1938. After that, it wouldn't become an issue again until the 1970s when the United States saw the death penalty challenged constitutionally at the state and national level. In 1972, the California Supreme Court found capital punishment to be cruel and unusual punishment. The court wrote, it is "incompatible with the dignity of man and the judicial process." The Supreme Court of the United States followed suit the same year finding that the way the death penalty was applied constituted cruel and unusual punishment. In response, they temporarily suspended executions nationwide. But that was not the end in California. A state measure to override the state Supreme Court passed that November of '72; it would amend the state constitution to allow the death penalty — much like Prop 8 did with gay marriage. Then the U.S. Supreme Court in 1976 started to allow the death penalty again — assuming certain criteria were met. So the state passed another proposition in 1978 that amended the death penalty law to meet the Supreme Court's standards. That's the law that's still in place toay . But it hasn't resulted in many executions. In fact, from 1967 to 1992 there were none in the state. That changed in 1992, with the execution of Robert Harris. He is one of 13 Californians put to death since the 1960s. In 1994 the gas chamber was found to be unconstitutional and lethal injection took over. That too, since December of 2006, has been found in the courts time and again to also be cruel and unusual punishment because it could produce extreme pain if administered incorrectly. Therefore none have occurred since January of that year, when Clarence Allen was killed. Other court cases have weighed the slow appeals process in the state and infrequent application also render it unconstitutional. The state has potentially found a new injection process that would pass muster, but two ballot initiatives put it on pause until Nov. 8. Those are the aforementioned Prop 62 and Prop 66. The former would have repealed the death penalty and replace it with life in prison without parole. It would have applied to everyone already on death row and have required them to work in prison and pay restitution to the victims' families. A similar vote in 2012, Prop 34, was defeated; 52 percent of Californians voted to keep the death penalty. The other ballot measure this year is Prop 66, which was approved on Nov. 8. It keeps the death penalty and quickens the appeals process by allowing trial courts to take the initial petitions as opposed to the California Supreme Court, as is now the case. It also requires specific lawyers that are appointed to work on the cases. It also says that other measures, read Prop 62, would be void if Prop 66 gets more votes. Newspapers around the state have endorsed Prop 62, to repeal the death penalty, but polls show Prop 66 with the potential advantage. And the polls were right. Though California has proven to be "progressive" in many ways, it would still prefer to hang onto the death penalty.